Our 5.5 x 8.5 binder and sheet protectors are probably one of the most versatile products we have. The 5.5 x 8.5 size is just so convenient and can be used for so many different purposes. The number 1 most popular use for it is to organize Classical Conversation Timeline cards. For many years now we have had customers who buy both our binders and sheet protectors to help them protect and organize these Timeline cards for their kids. However, as it turns out, there are other uses for the 5.5 x 8.5 size that has slowly become more and more useful. One of them is for organizing Playbills. Playbills, for those who don't know, are booklets that features details of the different Broadway plays through out the year. Play goers will subscribe to Playbills yearly subscription and receive a Playbill booklet every month. These booklets are 5 and 3/8 inches by 8 and 1/2 inches, so they fit perfect into our 5.5 x 8.5 sleeves with a little bit of room to spare. Once put in the the sheet protectors, you can organize them anyway you like with our 5.5 x 8.5 Mini binders. Sort them anyway you wish in the binder and flip through them easily when you want to browse through them. The crystal clear material makes it very easy to see the actual Playbill. Available now on Keepfiling is the Playbill Binders Set; includes 2 binders and 1 pack of sleeves (50 sleeves). 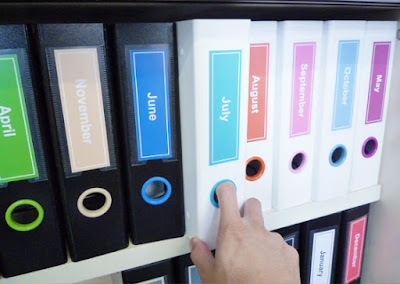 A feature that is often overlooked with Keepfiling binders is the finger hole. Located on the binder spine (always 2 inches from the bottom), the finger hole provides an easy way for you to take the binder on and off shelves, table, or wherever you are placing your binders. Simply slide your finger into the hole and move your binder around. This is a very convenient feature that does not get enough credit. What's also unique with Keepfiling's finger hole is that it comes with a 'ring'. Rather than just cutting a hole in the spine and leaving it as it is, we made this 'ring' that snaps on easily. This 'ring' adds a touch of designer and professionalism to give the binder a more complete look. Each Keepfiling binder comes equipped with a 'ring' matching the inside color of your purchased binder - so that's either Snow White, Lime Green, Sapphire Blue, and Red. Over the years we have had customers ask if they can purchase extra 'rings' or if other colors were available. Today, we are very happy to answer both questions with a yes as we are now selling 'rings' separately, and in different colors as well! Each color is sold individually in a pack of 12 'rings'. You also have the option to purchase a mix pack with one of each color. These are easy to use 'rings' as they just snap on and off easily. You can change them easily and mix and match colors to your own liking. You can come up with a nice color system to keep your binders organized. Check the rings now on our website and learn more! Since the launch of our White Zen View Binders, we've been working on coming up with ideas on how to make them stand out and be even more unique. With our new 'rings' this can be achieved as the new colors pair up with the white binders perfectly. Once you're purchased our new 'rings', you can swap out the original one that comes with the binder and use the new ones in a colorful and fun way - as you can see in the picture above. You can even have matching colors for the 'rings' and the actual spine label. Just simply download our spine label templates for free and you can match the together. The template are very easy to use - just download them, edit the label name to your own liking, print it, then cut them along the dotted line and voila! Tired of all the standard looking binders out there? Wish you had something unique and special that will stand out? Well what's better than designing your own sheet and using it as the front cover for your binder. While most view binders on the market today lets you insert your own cover sheet with the use of the clear front cover, not all view binders come with a mounting sheet that helps keep your cover sheet centered and secured. That is of course what our White Zen View Binders offer. As it comes with a clear front cover, it also comes with a mounting sheet that we've designed specifically for helping you keep your cover sheet centered in the clear front cover, and also for it to be secured. With the use of this special mounting sheet, plus your own creativity, you can come up with endless designs for your binder used for all sorts of purposes. The possibilities are limitless. You can use the binders at school, at the office, and even for personal use. The great thing about having the ability to design your own cover sheet and using it with the binder is that the binder becomes very versatile and will be suitable for what you want it to be. 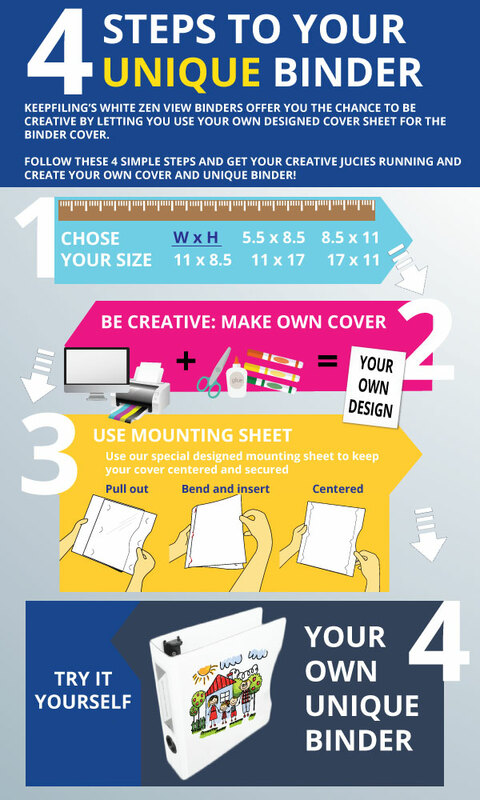 Follow these 4 simple steps and starting creating your own cover sheets for your view binders! If you're a teacher or parent you would encourage creativity and let the kids make something they can be proud to show and share with their classmates and parents. The Zen Binder is easy to use as you can insert pages into the clear front cover without hassle. It's a great tool to help inspire creativity from your students as they can let their own imagination run and design their own cover sheet They can design one for each subject or classes they are taking. In the professional world, standing out and making a good first impression is as important as the content that is delivered. A striking standout cover sheet to go with your presentation or proposal is very important. An excellent professional cover sheet with a Zen Binder goes a long way to catching the attention of your audience. If you are a collector or enthusiasts for certain memorabilia, then you would want to have a nice solid binder to protect and showcase your collection. The Zen View Binders will satisfy both needs. It is a durable archival safe binder that will protect your collection, at the same time it is also a nice looking binder that you can put on display for others to see. Furthermore, you can create your own cover sheet that matches your prized collection. Learn more about our White Zen View Binders and check out the different sizes we have available! Nothing beats finding the best deal online when you are shopping, whether it's online or at n actual store. The idea of knowing you were able to save even just a few dollars when you bought something can be very satisfying, especially for smart shoppers. If you're looking for the best binders and sheet protectors deals, than you don't have to look far - Keepfiling is your answer. We have the best deals for binders and sheet protectors that will save you more than just a few dollars. Look for our Save More badge when browsing our products and you'll know that's the best deal we have! All Keepfiling binders and sheet protectors are archival safe. Our products offer the best protection to your documents of different sizes and formats. We also pride ourselves in being organizing experts as we believe our products to provide the best organizing features to help keep your documents sorted and easy to find when needed. Need a good presentation binder? We have the right binder for you. View binders make for excellent presentation binders as they often have a clear front cover that lets you insert a cover sheet for your presentation. Our White Zen View Binders take it one step further an offers a mounting sheet that helps you insert the cover sheet, and more importantly helps to keep it centered in the binder cover. We designed he custom mounting sheet as we noticed that a lot of view binders on the market lets you insert a cover sheet, but more often than not the cover sheet will move over time and be misaligned. As professionals we understand the importance of appearances and having a presentation with a slated cover sheet does not portray professionalism, so we wanted to fix that. Each mounting sheet is designed with 'tabs' that will hold you cover sheet in place. Simply lift up the tabs and slide your covers sheet under them to keep it secured. It may sound difficult at first, but it's definitely very user friendly and once you see how it works you'll be able to use the mounting sheet without any problem. Like we said, we designed the Zen Binders with the intention to help you improve the appearances of your presentations. We accomplish that by including mounting sheets for each binder you purchase. To help even more, we've also created kits that you can purchase and use immediately as presentations. Keepfiling Presentation Kits available in 5 sizes. 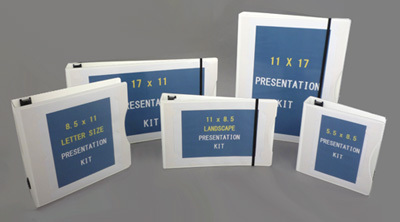 Our kits are aimed to help you get started with your presentations right away. All kits are ready for use immediately as they come with matching sheet protectors so you don't have to worry about getting the wrong size for you presentation. Shop now on Keepfiling for Presentation Kits and get 10% OFF on all kits. Buying binders and sheet protectors can sometimes be very stressful as you fuss and debate about the size you need and worry about whether the binder and sheet protectors will match. Through our experience, we often get questions from customers about which binder does the sheet protectors fit into, or which sheet protectors do we buy for this binder. With that in mind, we've been offering what we call 'Combos' - which includes a binder and several packs for matching sheet protectors. 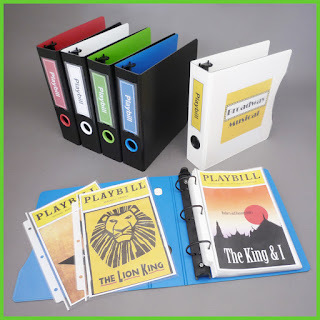 The idea of this was to make it easier for you to get what you need and to make sure that you have the matching binder and sheet protectors for your project. Without having to a binder and sheet protectors to your shopping cart separately, adding the 'Combo' to your cart instead will automatically include the binder of your choice and several packs of matching sheet protectors (the number of packs depends on the Combo you purchase). Now, we did not only make it easier for you to purchase a Combo when you need binders and sheet protectors but we've also given it a discount. By purchasing a Combo, you automatically enjoy a 10% discount - no coupon codes needed. When shopping on Keepfiling, look for the Save 10% badge to automatically enjoy the discount! 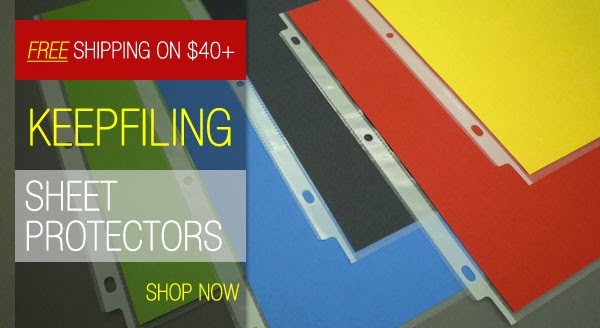 For years Keepfiling has been offering our typical black binders with a combination of either the red, blue, green or white color. It's sort of been our identity. This time around though, we are offering a all new binder that is yet again focused on functionality, but also with style and a bit of fun in it. We are proud to introduce the White Zen View Binders. As the name suggests, these binders are in white - a great contrast to our existing line of binders for those who are seeking for a bit of alternative. Furthermore, a new function or feature that we've added to the binder is a clear front cover pocket. What this clear front cover pocket does is it lets you insert a cover sheet for the binder. This cover sheet lets your to easy identify what the contents are inside the binder. For example if it's a presentation binder then you'll definitely want to have a cover sheet identifying the subject, who the presenters are, etc. On the other hand, if it's not a presentation binder but perhaps used for something less formal like a school binder then you can even have your kids or students to create their own cover sheet and insert them into the pocket. It's really is all up to your own creativity. Each binder can be unique with their own cover sheet and that's what we want you to enjoy. The process of creating something unique and personal or professional to be used. Other than adding the cover pocket to the binder, we've also designed a mounting sheet that will help keep the cover sheet centered when inside the pocket. This is a custom designed mounting sheet that you cannot buy elsewhere. We've spent time and paid great attention to the details of the mounting sheet to make sure it fits perfectly into the cover pocket. What we've done is used 'ears' on the mounting sheet that you can place your cover sheet into. These 'ears' will make sure your cover sheet is secured and centered at all times.